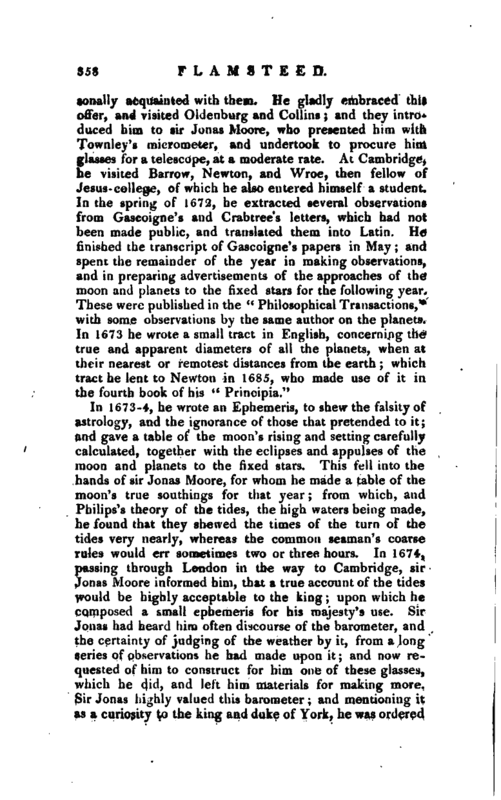 , a very eminent English astronomer, was born of reputable parents at Denby in Derbyshire, Aug. 19, 1646. 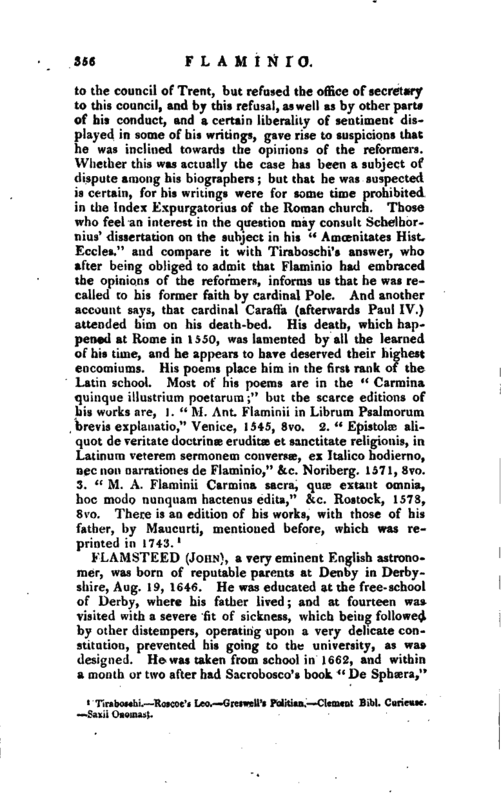 He was educated at the free-school of Derby, where his father lived; and at fourteen was visited with a severe fit of sickness, which being followed by other distempers, operating upon a very delicate constitution, prevented his going to the university, as was designed. He was taken from school in 1662, and within * month or two after had Sacrobosco’s book “De Sphscra,” | put into his hand, which he set himself to read without any director. This accident, and the leisure that attended it, laid the groundwork of all that mathematical and astronomical knowledge, for which he became afterwards so justly celebrated. He had already perused a great deal of history, ecclesiastical, as well as civil: but astronomy was entirely new to him, and he found great pleasure in it. 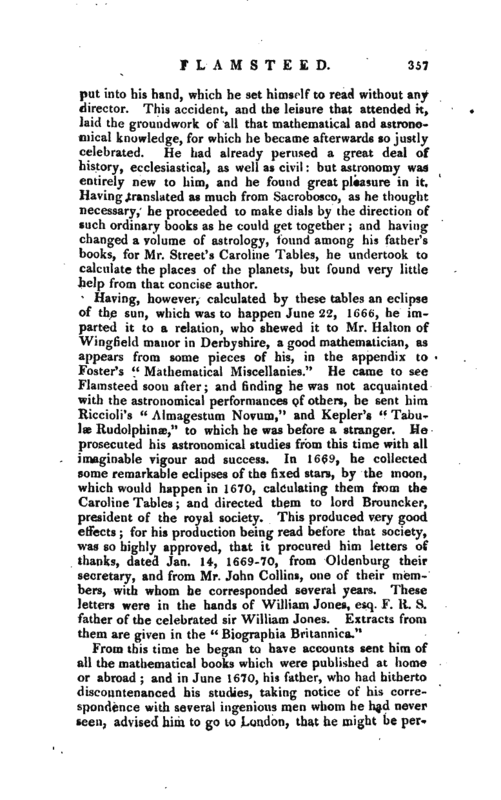 Having translated as much from Sacrobosco, as he thought necessary, he proceeded to make dials by the direction of such ordinary books as he could get together; and having changed a volume of astrology, found among his father’s books, for Mr. Street’s Caroline Tables, he undertook to calculate the places of the planets, but found very little help from that concise author. From this time he began to have accounts sent him of all the mathematical books which were published at home or abroad; and in June 1670, his father, who had hitherto discountenanced his studies, taking notice of his correspondence with several ingenious men whom he had never seen, advised him to go to Lqndon, that he might be | sonally acquainted with them. He gladly embraced this offer, and visited Oldenburg and Collins; and they introduced him to sir Jonas It ><% who presented him with Townley’s micrometer, and undertook to procure him glasses for a telescope, at a moderate rate. At Cambridge, he visited Barrow, Newton, and Wroe, then fellow of Jesus-college, of which he also entered himself a student. Jn the spring of 1672, he extracted several observations from Gascoigne’s and Crabtree’s letters, which had not been made public, and translated them into Latin. 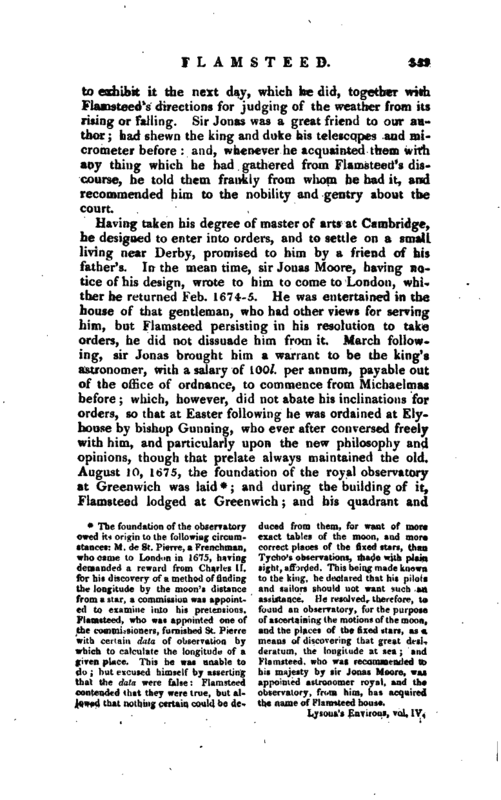 He finished the transcript of Gascoigne’s papers in May; and spent the remainder of the year in making observations, and in preparing advertisements of the approaches of the moon and planets to the fixed stars for the following year. 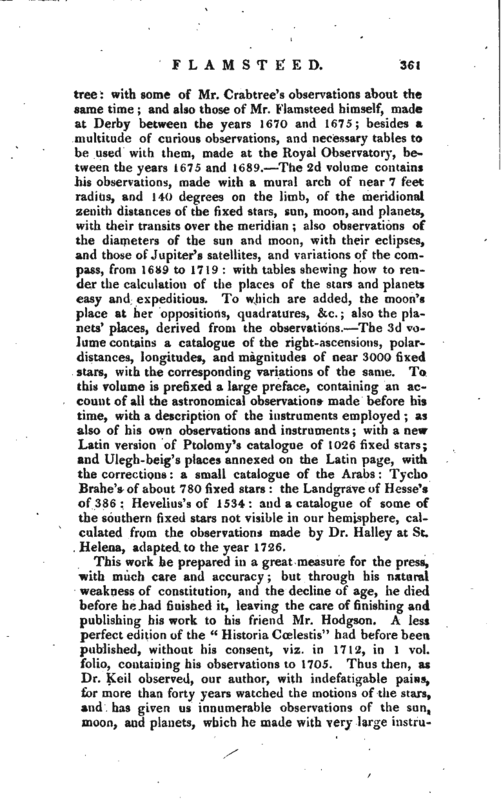 These were published in the “Philosophical Transactions,” with some observations by the same author on the planets. In 1673 he wrote a small tract in English, concerning the true and apparent diameters of all the planets, when at their nearest or remotest distances from the earth; which tract he lent to Newton in 1685, who made use of it in the fourth book of his *' Principia." In 1673-4, he wrote an Ephemeris, to shew the falsity of astrology, and the ignorance of those that pretended to it; and gave a table of the moon’s rising and setting carefully calculated, together with the eclipses and appulses of the moon and planets to the fixed stars. This fell into the hands of sir Jonas Moore, for whom he made a table of the moon’s true southings for that year; from which, and Philips’s theory of the tides, the high waters being made, he found that they shewed the times of the turn of the tides very nearly, whereas the common seaman’s coarse rules would err sometimes two or three, hours. In 1674, passing through London in the way to Cambridge, sir Jonas Moore informed him, that a true account of the tides would be highly acceptable to the king; upon which he composed a small ephemeris for his majesty’s use. Sir Jonas had heard him often discourse of the barometer, and the certainty of judging of the weather by it, from a long series of observations he had made upon it; and now requested of him to construct for him one of these glasses, which he did, and left him materials for making more. Sir Jonas highly valued this barometer; and mentioning it as a curiosity to the king and duke of York, he was ordered | to exhibit it the next day, which he did, together with Fiamsteed’s directions for judging of the weather from its rising or falling. Sir Jonas was a great friend to our author had shewn the king and duke his telescopes and micrometer before and, whenever he acquainted them with any thing which he had gathered from Flamsteed’s discourse, he told them frankly from whom he had it, and recommended him to the nobility and gentry about the court. lowed that nothing certain could be d.e-the name of Flamstet d house. Lysons’s Environs, vol. IV* | telescopes being kept in the queen’s house there, he observed the appulses of the moon and planets to the fixed stars. In 1681, his “Doctrine of the Sphere” was published in a posthumous work of sir Jonas Moore, entitled, “A new System of the Mathematics,” printed in 4to. About 1684, he was presented to the living of Burstow, near Blechingley, in Surrey, which he held as long as he lived. He was, indeed, very moderately provided for, yet seems to have been quite contented, aspiring after nothing but knowledge, and the promotion of the sciences. 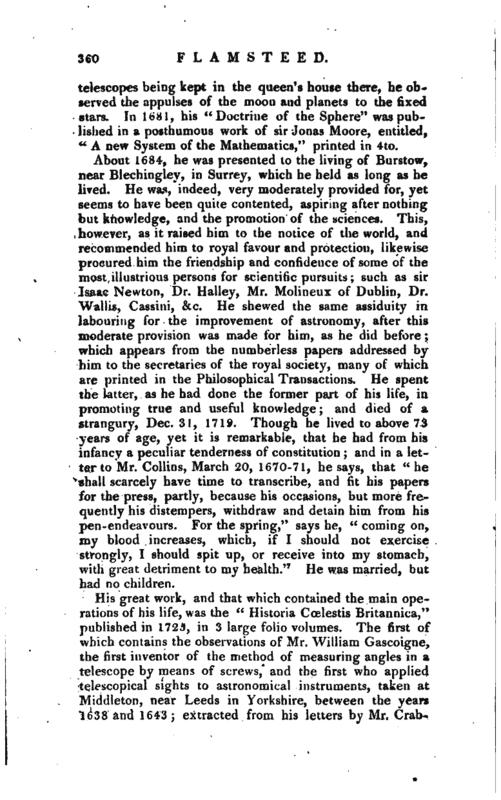 This, however, as it raised him to the notice of the world, and recommended him to royal favour and protection, likewise procured him the friendship and confidence of some of the most illustrious persons for scientific pursuits; such as sir Isaac Newton, Dr. Halley, Mr. Molineux of Dublin, Dr. Wallis, Cassini, &c. He shewed the same assiduity in labouring for the improvement of astronomy, after this moderate prdvision was made for him, as he did before; which appears from the numberless papers addressed by him to the secretaries of the royal society, many of which are printed in the Philosophical Transactions. He spent the latter, as he had done the former part of his life, in promoting true and useful knowledge; and died of a strangury, Dec. 3 1, 1719. Though he lived to above 73 years of age, yet it is remarkable, that he had from his infancy a peculiar tenderness of constitution; and in a letter to Mr. Collins, March 20, 1670-71, he says, that “he shall scarcely have time to transcribe, and fit his papers for the press, partly, because his occasions, but more frequently his distempers, withdraw and detain him from his pen-endeavours. For the spring,” says he, “coming on, my blood increases, which, if I should not exercise strongly, I should spit up, or receive into my stomach, with great detriment to my health.” He was married, but had.no children. His great work, and that which contained the main operations of his life, was the “Historia Cœlestis Britannica,” published in 1725, in 3 large folio volumes. The first of which contains the observations of Mr. William Gascoigne, the first inventor of the method of measuring angles in a telescope by means of screws, and the first who applied telescopical sights to astronomical instruments, taken at Middleton, near Leeds in Yorkshire, between the years 1638 and 1643; extracted from his letters by Mr. | Grubtree: with some of Mr. Crabtree’s observations about the same time; and also those of Mr. Flamsteed himself, made at Derby between the years 1670 and 1675; besides a multitude of curious observations, and necessary tables to be used with them, made at the Royal Observatory, between the years 1675 and 1689. The 2d volume contains his observations, made with a mural arch of near 7 feet radius, and 140 degrees on the limb, of the meridional zenith distances of the fixed stars, sun, moon, and planets, with their transits over the meridian; also observations of the diameters of the sun and moon, with their eclipses, and those of Jupiter’s satellites, and variations of the compass, from 1689 to 1719: with tables shewing how to render the calculation of the places of the stars and planets easy and expeditious. To which are added, the moon’s place at her oppositions, quadratures, &c. also the planets’ places, derived from the observations. The 3d volume contains a catalogue of the right-ascensions, polardistances, longitudes, and magnitudes of near 3000 fixed Stars, with the corresponding variations of the same. To this volume is prefixed a large preface, containing an account of all the astronomical observations made before his time, with a description of the instruments employed; as also of his own observations and instruments; with a new Latin version of Ptolomy’s catalogue of 1026 fixed stars; and Ulegh-beig’s places annexed on the Latin page, with the corrections a small catalogue of the Arabs Tycho Brahe’s of about 780 fixed stars the Landgrave of Hesse’s of 386 Hevelius’s of 1534: and a catalogue of some of the southern fixed stars not visible in our hemisphere, calculated from the observations made by Dr. Halley at St. Helena, adapted to the year 1726. 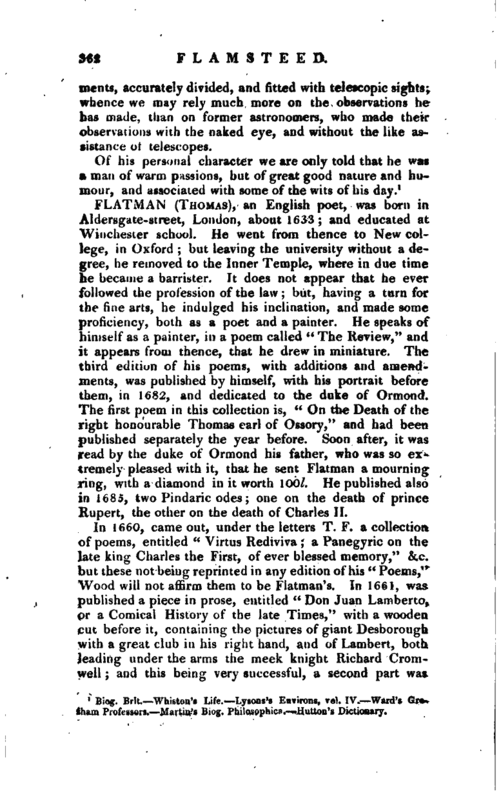 This work he prepared in a great measure for the press, with much care and accuracy; but through his natural weakness of constitution, and the decline of age, he died before he had finished it, leaving the care of finishing and publishing his work to his friend Mr. Hodgson. A less perfect edition of the “Historia Ccelestis” had before been published, without his consent, viz. in 1712, in 1 vol. folio, containing his observations to 1705. Thus then, as Dr. Keil observed, our author, with indefatigable pains, for more than forty years watched the motions of the stars, and has given us innumerable observations of the sun, moon, and planets, which he made with very large | instruments, accurately divided, and fitted with telescopic sights; whence we may rely much more on the observations he has made, than on former astronomers, who made their observations with the naked eye, and without the like assistance of telescopes. 1 Biog. Brit. Whiston’s Life. T.ysons’s Environs, vol. IV. Ward’s Grcharn Professors. Martin’s L>iug. Plulosophica. lluttou’s Dictionary.